“And this is the confidence that we have toward him, that if we ask anything according to his will he hears us. And if we know that he hears us in whatever we ask, we know that we have the requests that we have asked of him,” says 1 John 5:14-15 (ESV). Prayer is extremely powerful but often times we forget how truly versatile a weapon it is. This, in essence, is what the new film – War Room, is about. Directed by Alex Kendrick and produced by Stephen Kendrick, this movie follows a family where the mother and father are struggling in their marriage. Tony Jordan, the husband, has an occupation that takes him away on trips often. This ends up putting a strain on his relationship with his wife Elizabeth who has festered frustration and exasperation towards him. With their disagreements becoming more common and an inward struggle growing in Tony’s heart, a certain spunky character makes an appearance. Miss Clara. An older woman with wisdom to spare, meets Elizabeth, who is a relator, when she puts her house up for sale. As they tour her home, they come across a certain room – err, closet. Miss Clara informs her that this is her prayer closet where she undergoes her most strenuous battles. Needless to say, Elizabeth is surprised by this interesting notion. Ever the chatterbox, Miss Clara senses an unrest in the younger woman and begins to prod. A bit wary at first, Elizabeth tells Miss Clara she will consider her offer of meeting the consecutive morning. She meets her. And such starts a lovely mentor-student relationship where Miss Clara teaches Elizabeth the fine art of fighting everything through prayer. Danielle, the daughter of the Jordan’s, and Jennifer, her good friend, find her mother in her clothes closet. Or what used to be her clothes closet. Elizabeth has begun to follow in Miss Clara’s footsteps and transform her own closet into one of prayer. Sticky notes and colorful paper are tapped onto the wall with scrawling’s of prayer letters along with several photos reminding her of those she is praying for. Meanwhile, Tony is battling himself with the desire to cheat on his wife over a co-worker. As the movie progresses forward, he begins to notice a change in Elizabeth’s attitude towards him. Unlike before, now she tries her best to offer him grace as Jesus does. This in turn ends up having a great effect on Tony as he marvels at this. With the discovery of Elizabeth’s prayer closet, he is humbled by how she has been praying for him and realizes he needs to get right with God and his family. Asking for forgiveness and confessing his wrong-doing, tears fall as the full extent of his actions is understood. However, the strife is not yet overcome with their marriage slowly being restored. Tony has a secret to confess – one that could have disastrous consequences. He has been sneaking one bottle of pills for himself to sell after each business trip. It amounts to over five thousand dollars in all. Fearful, yet knowing that this is the right course to take, Tony returns the pills to his previous boss and prepares to take whatever decision they make. The two men in charge have completely different reactions. One desires to prosecute him immediately while the other, Coleman, decides to have two days to think it over. And so the prayer waiting begins. Amazingly, Coleman comes to the choice of not prosecuting Tony Jordan and offers an overwhelming gift of grace. The couple celebrates and praises God as the goodness of His mercy falls on them. 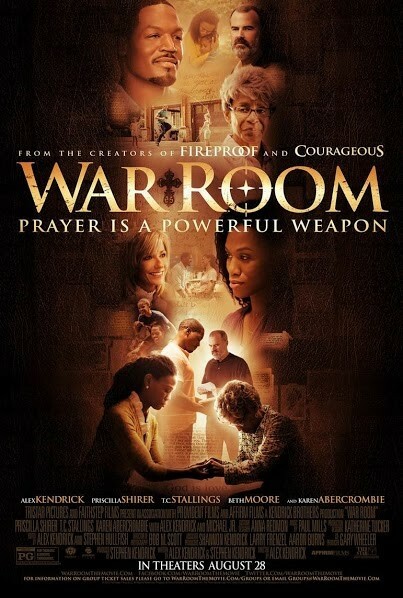 I would recommend War Room to people of all ages and diversity. It is in theatres now and I encourage you to go see it!